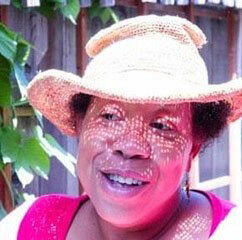 An African American “farm-her” living in the South Berkeley flatlands after a long career in education and organizational leadership, Wanda is most passionate now about growing herself, her food, and her people. A master gardener, certified permaculture designer, garden/life educator and program consultant holding a degree in Psychology from Temple University, Wanda owns and cultivates Obsidian Farm – her home with edible landscaping and chickens - as a model for what’s possible in an urban environment. Her consulting service, Obsidian Farm Transformations, specializes in the design of garden-centered change, health and wellness initiatives, and courageous conversations about race, justice and our environment. She knows in her heart that we must all “grow the power,” together. The primary focus of her professional career has been strategic development in schools and non-profit programs, community outreach and engagement, and communications. Honed in leading, teaming and managing administratively, her work facilitates organizational advancement to the benefit of people, programs and profit. In the City of Emeryville, for example, that work included significant responsibility in laying the foundation for its groundbreaking community school construction project and programs, fostering neighborhood and business partnerships, creating innovative job/career programs, and marketing for school/community enrollment. Her ability to envision, implement, manage and speak persuasively has been essential to elevating institutional cultural competency and programmatic effectiveness, collaborating successfully on capital and annual fundraising, increasing revenues, supervising students and sub-ordinates, and nurturing a diverse constituency that thrives as a whole. Wanda harnesses that expertise, blends it with her passion for growing good food and good folks, and advises and inspires municipalities, schools, and urban agriculture groups who seek to positively impact the ways in which people eat, learn, live and love. The seemingly revolutionary acts of producing and harvesting one’s own food while pursuing justice and social equity is unquestionably transformational to individual, communal and environmental vitality. For Wanda, our commitment to growing healthy food and healthy community (as one and the same) is necessary for insuring a hopeful, sustainable future for all.